Today Amazon officially announced the launch of library ebooks on the Kindle and Kindle apps at 11,000 libraries across the United States. The story of library ebooks on the Kindle already broke two days ago when a couple of Seattle libraries started listing a section for Kindle ebooks. Here’s a Kindle library ebook tutorial that explains how everything works. The tutorial includes a video demo and directions for getting library ebooks. Library ebooks work differently on a Kindle than other ebook readers. 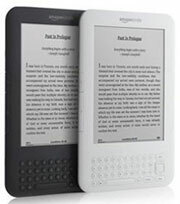 First, Kindles don’t support Adobe EPUB and PDF so you don’t have to use Adobe Digital Editions at all with the Kindle. Instead you send the ebook over WiFi by selecting the “Send to Kindle” option when selecting an ebook from the library. It then re-directs to Amazon.com to login. You can also transfer the ebook to a Kindle over USB if you don’t have WiFi. Library ebooks cannot be delivered over 3G because nobody is paying for delivery. Check this earlier post for more information about how library ebooks work on Kindle devices and Kindle apps and this post for more information about how to get ebooks from local libraries.